Nassau, Bahamas - Integrating the visual arts with a diversity of cultures and the bio-diversity of underwater life in the pristine seas surrounding The Bahamas, under the theme “The Colour of Love, the seventh edition of Islands of the World Fashion Showcase will explode in a burst of tropical colours in the romantic setting of the Humidor Piazza of Graycliff Hotel & Restaurant on Saturday, 20th May 2017. DKlypse Swimwear by Kristen Cartwright of The Bahamas, Sun, Sea and Sand by Persida Louison of Haiti, and Rock That Style by Greg Williams of Barbados are the individual designers presenting their new collections. Exiles, which is a collective and collaborative initiative encompassing several designers will be making it’s second major presentation at IWFS. Designers selected to come under the Exiles label this year include Brynda Knowles and Renaldo Johnson of The Bahamas, Saint George Fashion House by Kazz Forbes of Turks & Caicos, and Raymond Brown of the United States of America. In addition, Mr. Johnson, as a budding designer, was chosen to launch the premiere of the “Haute Arte Couture” collection, which fuses fashion and art, challenging the designer to interpret a piece of visual art and translate that into a unique fashion garment. Mr. Johnson selected art pieces by Bahamian artist John Edward Cox and Cuban artist Alberto Lago. 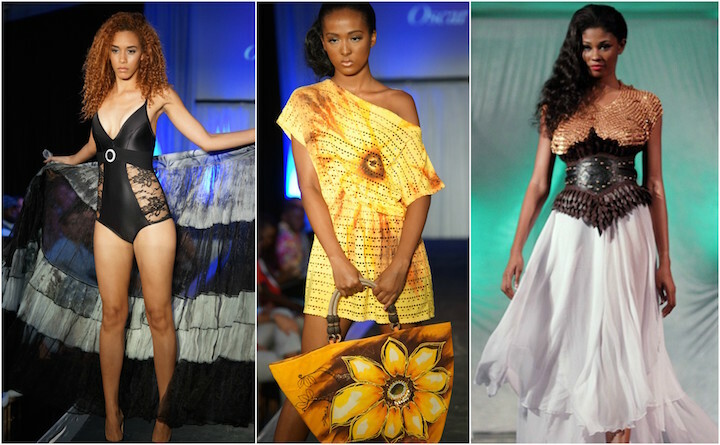 Models for the event have been selected from The Bahamas, Trinidad & Tobago, Haiti, and the United States of America. Owen Bethel, founder and producer of the award-winning event, explained that the Exiles label “is a direct evolutionary offshoot of the Showcase which was designed primarily to provide an avenue for media and trade exposure for both young and established designers with an origin in the islands around the globe. To date 72 designers, representing 17 island nations and 3 non-islands, have presented their creations on the catwalks of IWFS. Several have been successful in having their products purchased by boutique stores in the United States and mega-stores such as Top Shop in the United Kingdom. Mr. Bethel notes that “both the event and label are meant to be more than just fashion statements, but also tools for bringing public awareness to several issues particularly affecting island nations. In addition they are to be vehicles for promoting and encouraging the business of fashion and its potential significance as an instrument of economic growth and diversification in island nations. The event was endorsed from inception by the United Nations Educational, Scientific and Cultural Organization (UNESCO) for its efforts in respect of cultural diversity and the encouragement and preservation of traditional methods of handicrafts and fashion, and issues such as climate change, poverty alleviation, human trafficking, and the training of youth on HIV/AIDS, and their impact on island nations. Curtain time on the 20th May is 7.00 p.m. sharp. Tickets are available online at www.islandsfashionweek.com ($30 for General Admission and $20 for students with a valid ID) or at the door on the day of the show.